Fishing for trout in Wairau River, Marlborough. Abalone fresh from the river. Marlborough. Along with fabulous wines, fresh produce galore. Fresh plums from the vines at Windsong Orchard. Marlborough. Wine is at the heart of Marlborough fare. New Zealand’s wine-growing capital isn’t all pinot and sauv’ blanc. As Alissa Jenkins finds, Marlborough is also a rich hub of foodie goodness for any modern day hunter-gatherer… of which wine is a very lovely part. There are many not-so-glamorous things about being a travel writer. Believe it or not. Late nights, plane delays, living out of a suitcase and a takeaway diet… However there are some pretty big perks as well. And Cloudy Bay Forage is one of them. Every year a group of 10-plus hacks are flown into New Zealand’s wine-producing capital, Marlborough (on the South Island’s north-east tip), and treated to an exclusive behind-the-scenes tour of artisan producers and providores, over two fly-popping days. Because what many over-indulged and blurry-eyed visitors miss is that the geographical good fortune that Marlborough’s wine makers exploit to great effect has equally blessed an array of other local produce. In the shadow of the 140-something local wineries are thriving aquaculture, lamb, venison, beef, stone fruit, olive and honey industries. As a result, one of the region’s most renowned wineries, Cloudy Bay (cloudybay.co.nz), has taken on the duty of showcasing Marlborough’s foodie secrets by hosting this exclusive, no-expenses-spared forage. We are soon very lucky hacks who are divided into groups and sent off to explore the four points of the compass with a Cloudy Bay executive team leader. Some are sent south to Glazebrook Lodge in the Waihopai River Valley to hunt deer; others travel across to Renwick’s Windsong Orchard to pluck juicy organic plums; and a lucky few venture up to Marlborough Sounds to the famous Ora King salmon fishing grounds. As part of the ‘Team East’ trio (headed by winemaker Nick Blampies-Lane), our forage kicks off with a scenic flight from Blenheim, the region’s town centre, over a patchwork of vineyards and rugged peaks until we land 50 kilometres south-east on the secluded tip of Cape Campbell. Undulating hills peppered with flocks of sheep surround Cape Campbell Lighthouse overlooking deep sapphire waters. It’s here we meet with the boys of Cloudy Bay Clams (cloudybayclams.com), who are pioneering in the industry of native surf clams. “Surf clams have a very different taste and texture to say, oysters. They can be served raw but are also suited to a range of cooked applications,” says Dion Brown of Cloudy Bay Clams. In the shellfish playground, I imagine surf clams to be the hipsters of the bivalve world. Although the team usually harvest from Cloudy Bay, today we’re further south and in shallower waters, which is prime territory for snorkelling for paua (otherwise known as abalone), rock lobster and kina (or sea urchin). We’re soon kitted out in wetsuits, snorkels and weight belts before hitting the water to begin our hunt. I am not a natural. I catch rocks rather than rock lobsters. But my helpful group take pity on me and I dive for crayfish spotted by others. It does take some of the shine off the unique experience but it certainly beats picking up a paper-wrapped parcel from the supermarket deli. Although Cloudy Bay Clams don’t offer this experience commercially, any visitor can snorkel off Marlborough’s coast and catch crayfish or paua. There are daily limits – that’s six crayfish and 10 paua a day, but you don’t need a licence and it’s free. 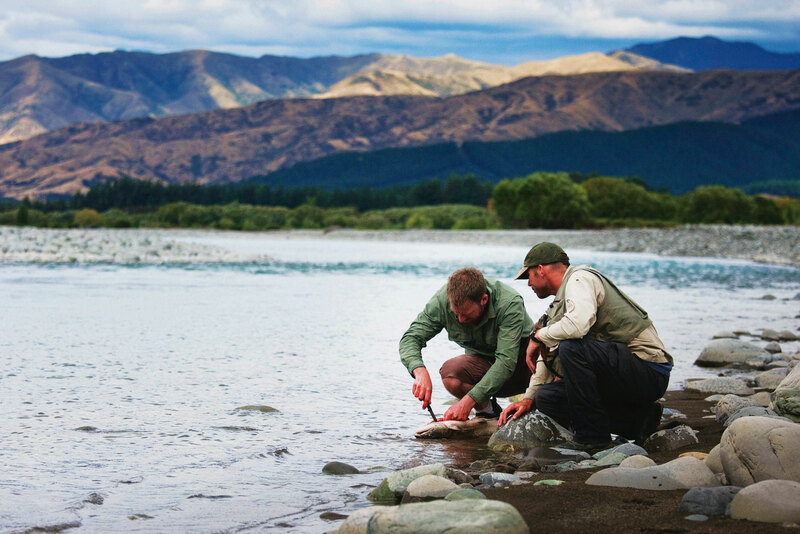 Or for guided experiences, Salty Fly Lifestyles in Blenheim offer snorkelling, spear fishing and fly fishing around Marlborough, with all the necessary gear. Now with pruning hands and my fill of salt water up the nose we return to land and load two styrofoam boxes with wriggling crayfish, paua and a couple of ill-fated kina. After a seafood lunch overlooking Cook Strait, trees begin to waver and the grass is blown flat as a shiny black helicopter descends from the sky to fly Team East to our next forage. From wetsuits to headsets, it’s all rather 007. Just west of Blenheim in Omaka Valley, we are greeted by the veiled faces of Renee and Dale De Lucca – one of Marlborough’s newest food producers. They’re the husband-and-wife team behind Putake Honey (putake.co.nz); Maori for ‘origin’. The De Luccas have an interesting origin themselves. Before moving to the local region, they were running an IT business in Sydney. However when their third child came along, the couple decided it was time for a more wholesome, slower-paced way of life. “We wanted our children to grow up in rural New Zealand, we wanted them to be able to run outside freely in bare feet, climb trees and know that fruit comes from trees and not the supermarket,” says Renee, who grew up in Marlborough herself. “The weather, the condition of the soil and the nearby flowers all combine to have an effect on the taste, colour and texture,” she adds. A honey-tasting soon reveals these differences are surprisingly distinct. Varying degrees of sweet, spicy and floral flavours come through; their Manuka style is smoky and woody, the Wildflower is expectedly floral while their Matagouri honey is somewhat chocolatey. These bees have been especially busy. Unlike many other honeys on the market, Putake is made without additives, blending or heating, so what the bees produce naturally is exactly what ends up in the jar. Better still, Putake is currently constructing a purpose-built honey house nearby so visitors can dress in dorky sci-fi suits and play with bees anytime. It’s expected to open at the end of the year. The bizarre thing about Marlborough’s blossoming food scene is a lot like Tasmania’s; while there is a rich bounty of locally-grown ingredients, there aren’t as many local restaurants capitalising on it. “I think there aren’t more people using local produce because of the work that is involved in sourcing it, invoicing it, working with the supplier and time that is required,” says Chris Fortune, renowned local chef, chair of Farmers’ Markets NZ and chairperson of Marlborough Community Gardens. Our forage culminates with a ten-course degustation dinner prepared by the face of Masterchef New Zealand and the chef behind Auckland’s renowned Euro restaurant, Simon Gault. He and his team weave their magic back at Cloudy Bay Estate, transforming our scavenged goods into exquisite works of art. A fleshy Tio Point oyster is served with a delicate mandarin sector and a tangy jalapeno dressing. Our Cape Campbell crayfish is almost unrecognisable; parcelled up into a crepe-like roll with crab, cucumber and mango, balanced by a glass of divine 2011 Cloudy Bay chardonnay. Fine circular slices of Glazebrook venison are artfully arranged around a generous smear of horseradish custard and crispy capers. And a Putake Honey taco makes for both a tasty dessert and a fittingly sweet end to our forage. Yes, this is one delicious perk of the job. It’s one of those few destinations that you wouldn’t guess is internationally-renowned. Without long queues, tacky souvenir shops or jacked-up prices, the region has remained true to its rural roots with a distinct community feel and country-town charm. For all the fresh local produce, there isn’t a strong restaurant offering that promotes the region’s food scene. Short of repeat visits to the same restaurants during your stay, we suggest collecting your own local ingredients and cooking them yourself. The seasons aren’t as extreme as in the south of the island; however we recommend visiting late summer to early autumn for the most pleasant weather. Coincidentally, it’s also when Marlborough’s prized grapes are harvested, and the area is generally abuzz. On 8 February 2014, the Marlborough Food and Wine Festival (marlboroughwinefestival.co.nz) will celebrate its 30th year with stalls, tastings, tutorials and plenty of entertainment. Although self-driving is an option, we suggest hunting down the local wines by jumping on board a tour like Marlborough Wine Tours (marlboroughwinetours.co.nz). That way you can really enjoy the experience, without worrying about drink driving.